We are currently on site at the new Community Centre & Primary School Extension in Kelty. 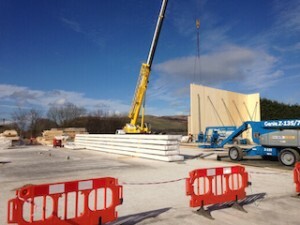 Here we are working with our partners Hybrid Build Solutions to erect the largest CLT project in Scotland to-date with 6000m2 of panels comprising CLT panels from Austria and VUT panels manufactured in Scotland. Hybrid Build Solutions are designing and supplying all the materials and have employed East Fife Joinery to undertake all their installation works. This is one of several projects we are currently carrying out with Glulam Solutions / Hybrid Build Solutions and is being carried out by our specialist team of joiners. CLT Panels in the games hall area are up to 10m high and required specialist propping as well as great care and attention. We hope to have this project completed in an overall eight week programme.